A practical and progressive approach to self-protection, health, fitness and personal security. The use of force is one of the main focuses in most self-protection training as well as in the martial arts. However, its justification and subsequent application to real violence is also singularly the least well-addressed area of understanding. In short, if practitioners train without an understanding of the law then while their training in use of force may be excellent, their knowledge of when, how and particularly why they should be using said force will be severely lacking. The danger of this legal ignorance is binary: while some may be unwittingly training in such a way that they are unconsciously conditioning themselves to default to excessive and unjustifiable levels of force (or to use force when it is not necessary), others may become too afraid of legal repercussions to use sufficient force when it is legitimately required. Some may be so afraid of these ramifications that, through their perception that the law offers no protection to those acting in self-defence, they will not act at all. Thus, it is important that we address both the encouragement of violent aggression and the discouragement of legitimate use of force in self-defence as in different ways both of these unfortunate situations enable victimisation. The following is a brief look at UK self-defence law in an attempt to discuss its meaning in terms of self-protection training to better explore what it means for practitioners of self-protection methods. Whereas statute law more rigidly adheres to statutes that are designed to cover all eventualities, common law makes more use of judicial cases, meaning that judges can have more power to adapt to individual circumstances without Parliament having to enact legislation. A person may use such force as is reasonable in the circumstances in the prevention of crime, or in effecting or assisting in the lawful arrest of offenders or suspected offenders or of persons unlawfully at large. Note that according to the CPS, section 3 only applies to crime and not to civil matters. So, for instance, it cannot afford a defence in repelling trespassers by force, unless the trespassers are involved in some form of criminal conduct. For matters involving property and householders, researching the Criminal Damage Act (1971) and Section 76 of the Criminal Justice and Immigration Act 2008 may be beneficial. Thus we have two options for justifying use of force for self-defence in the event of an accusation of excessive or unreasonable use of force: the common law route which is concerned with support from case precedents and the statutory route where the justification is the prevention of a crime from taking place (i.e. an assault). When Can we Use Self-Defence? Use of any force aside from in training is strictly not allowable, and any action other than running away is difficult to justify as it demonstrates lack of control. Any degree of force is justifiable if you honestly believed you were in danger at the time, as fear and adrenalisation are justifications for poor judgement of force. “I’d rather be judged by 12 than carried by 6”: simply disregarding the law altogether, simplifying the situation into a polarised choice of being killed or being judged. Armed with an understanding of the law and what it allows for, we can make better decisions about how to defend ourselves against violent crime and prepare ourselves with training that is both more efficient and more effective. Why Use Force At All? So you’ve used force against someone who either was using force against you or who was about to do so. What then? To impress others or find feelings of self-worth or a sense of achievement in hurting someone. Some will sound more reasonable than others to you, no doubt. Some are more understandable than others, too. Regardless of any personal ethical considerations, how do these hold up as reasonable excuses for using force against someone? Which of these can be reasonably justified in terms of necessity? The objective in using force against another person is simple: to prevent a worse crime from taking place. In almost every situation of assault, the goal should be to use force for one purpose only: to facilitate your escape. In many situations, escape may be possible without using any force at all, or force which is unlikely to cause actual bodily harm. In situations where that is impossible, the amount and severity of the force used must then be justifiable as a reasonable level of force for that situation. was the force used reasonable in the circumstances? This in itself doesn’t really help us to understand much more clearly, but it brings us to an important understanding nonetheless: the notion of reasonableness is subjective. Goodie is sitting waiting for his train. Baddie gets off another train, drunk, and tries to hit Goodie. He hits Goodie with a glancing blow and continues to swing punches. Goodie, scared and startled, slaps Baddie hard in the face and runs away while Baddie stumbled with a ringing ear and a stinging cheek. Goodie is sitting waiting for his train. Baddie gets off another train, drunk, and tries to hit Goodie. He hits Goodie with a glancing blow and continues to swing punches. Goodie, scared and startled, slaps Baddie hard in the face before grabbing him around the neck and sinking his elbow into Baddie’s face seven times. Baddie passed out, and then Goodie punched him to make sure. Both of these “Goodie” characters can argue that they were preventing a crime from taking place: Baddie was trying to hit them after all. As they were sitting down and the surprise came as an attack, simply leaving was not an option at that time. However, whereas in situation 1 the character took the opportunity to leave without using more force than was necessary to prevent further crime from taking place, in situation 2 he missed that opportunity while he was continuing to use more force than was required. In situation 2, the focus shifted from self-protection to retaliation. This was a slightly silly and exaggerated example, but it illustrates the point. The objective in using force against another person is simple: to prevent a worse crime from taking place. In almost every situation of assault, the goal is to use force for one purpose only: to facilitate your escape. In many situations, escape may be possible without using any force at all, or force which is unlikely to cause actual bodily harm. In situations where that is impossible, the amount and severity of the force used must then be justifiable as a reasonable level of force for that situation. If it is enough force to prevent a worse crime from taking place, without being excessive in nature, then it is more likely to be considered reasonable. Failure to retreat when attacked and when it is possible and safe to do so, is not conclusive evidence that a person was not acting in self defence. It is simply a factor to be taken into account rather than as giving rise to a duty to retreat when deciding whether the degree of force was reasonable in the circumstances (section 76(6) Criminal Justice and Immigration Act 2008). It is not necessary that the defendant demonstrates by walking away that he does not want to engage in physical violence: (R v Bird 81 Cr App R 110). There are other ways that unwillingness can be demonstrated, for example through verbal and nonverbal communication. Remaining non-aggressive and attempting to calm the aggressor down, apologising for any (possibly imagined) wrongdoing, etc, are useful things to bear in mind. That said, if it is safe and possible to leave then that should always remain the clear, logical objective of any force deployment. Retreat is a greatly preferable outcome, not an absolute duty. Section 76(3) confirms the question whether the degree of force used by the defendant was reasonable in the circumstances is to be decided by reference to the circumstances as the defendant believed them to be. This is where the term “honestly held belief” comes into things. When deciding whether a use of force was reasonable, the defence of said use of force is to be considered based on the defendant’s honestly held belief that they were either under attack or that they were under imminent threat of attack. In short, as long as the level of force remains proportionate and reasonable, someone under imminent threat of assault need not necessarily wait to be physically assaulted before they act. A (proporionate) “pre-emptive strike” may be used if it is honestly believed to be necessary. This is not a “get out of jail free card”, however. It does not allow people to use unnecessary, excessive levels of force without repercussion as long as they say that they believed they needed to! Section 76(4) states that “the more unreasonable the belief, the less likely it is that the court will accept it was honestly held”. The important point to remember is that this allows for the use of force to be proactive as opposed to merely reactive, in situations where its necessity can be justified. This act we’ve discussed also goes on to discuss “householder cases” and the use of disproportionate force, so it is another useful act to be familiar with. Broadly speaking, the following areas of self-protection understanding form a methodology whereby if one stage fails or is inappropriate to the situation, the next should then be considered to avoid escalating to unjustifiable or excessive use of force. Aside from legal considerations, for the sake of safety in terms of physical, psychological and social wellbeing physical conflict should of course be avoided at all costs. This logical methodology will help to manage such risks as well as avoid the legal repercussions of handling a situation of self-protection poorly. ‘Threat awareness’ is a state of being whereby an individual is maintaining the ability to perceive and cognitively react to an event or quality of their surroundings. Through threat awareness, understand the situation to the best of your ability. Through threat avoidance, decide whether you can escape without combat. Simply put, if you can see a potential situation beginning to escalate early enough, you can simply leave. Threat evaluation should be a theoretically informed approach, meaning that it stems from an understanding of the area you’re in, the nature of violent crime, etc. Do some research and educate yourself if you can. That said, never ignore your gut feeling. If a situation doesn’t feel right, leave. This can either be passive avoidance (not going to areas where you know bad things are likely to happen) or active avoidance (walking or running away). If you remove yourself from the situation, you’ve prevented the crime from taking place without using force. If the above fails or is not viable, then communication may be a way to end the situation without violence. This communication, verbal and nonverbal, could be placatative, deceptive, distracting or intimidating depending on the situation and what it calls for at that moment. If immediate escape or avoidance is not viable, employ communicative strategies to effect one. If the above three stages have all failed or were not viable, then force may be necessary to effect your escape. This force, as discussed above, must be both necessary and reasonable in order to be considered legally justifiable. This article is not intended for legal advice and it has not been written by an expert in law. You should not take legal advice from anyone who is not qualified to give it, and I (Josh Nixon, the writer) am just a layperson who is interested in the topic as a self-protection practitioner and instructor. This article is merely an attempt to clarify the often rather vague notion that is “reasonable force” and the justification of the use of force generally, as a basic starting point for interested parties to begin their own research and learning from. The various topics such as threat awareness, evaluation and avoidance, etc will be expanded upon separately in further writing. If nothing else, this article is a reminder to all those who practise self-protection, martial arts or any related disciplines that an awareness of and respect for the law simply has to be an intrinsic part of your training mentality and methodology, or you are doing yourself a grave disservice. The nature of this subject is such that whether you are knowledgeable about it or ignorant of it, your responsibility remains the same. If excessive or unnecessary force is used and it cannot be justified, both the knowledgeable self-protectionist and the uneducated person are equally and inescapably responsible for their actions. The understanding of the law as outlined here cannot be used as an excuse to use force when you might have been able to avoid it, and it cannot be used as an excuse to use excessive levels of unreasonable force either. It is to be used, rather, to ensure a better-informed approach to your training so that no use of force is trained without consideration of not just how it should be done, but when and (perhaps most importantly) why. For a more in-depth and excellent reference book on this topic, I recommend Understanding Reasonable Force by Mark Dawes. It is essentially a better and more in-depth look at exactly what this article has discussed. At the time of writing, it is by far the best book on the topic I have read so far. Full details of the book can be found on our Recommended Reading page. Last edited on 29.08.2016: clarification of statute law, as opposed to “civil law”. Thanks to Peter Consterdine from the British Combat Association for this feedback. On Wednesday the 25th of April 2012 FCIns. 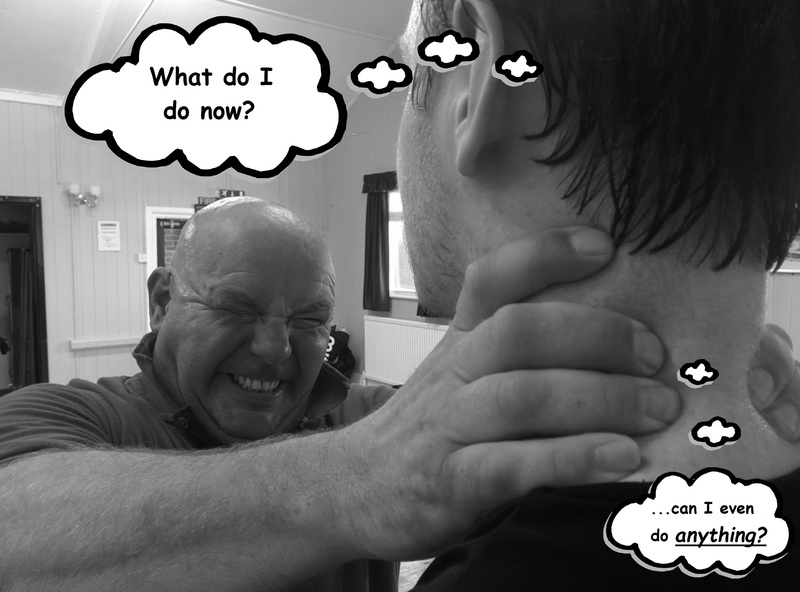 Josh Nixon (that’s me) will be representing the Combative Self-Protection System at Stoke College’s ‘Disability Day’. From 10:00-14:00 you’ll have the opportunity to speak with me and I’ll answer any questions you have about the CSPS or training in general. Details are also on our events page. The event will be held at Cauldon Campus on Stoke Road, Shelton, ST4 2DG, in the Sports Hall from 10:00-14:00 on Wednesday the 25th of April 2012. The aim of the event is to raise disability awareness and provide information, advice and guidance to individuals within the college and the general public. There will be over 60 organisations on hand to provide the most up to date information on a range of disability issues to an eager audience and the celebrity guests will be ‘Race2Recovery’ who have recently been on the BBC’s Top Gear. Notice: Private training availability back to normal! Enter your email address to subscribe to ESP and receive email notifications of new posts.